Cello Concerto #3 "Legend of the Phoenix"
I'm going to be blunt and say that I was not overly pleased with the 2014-2015 Detroit Symphony Orchestra season. From the beginning, I was wary of Music Director Leonard Slatkin's Concerto in America gimmick, and opening weekend with Sarah Chang was not a public or critical success. From there, Slatkin and his (mostly) young guest conductors proved unable to harness a rouge brass section and several baby-faced players in the winds and strings. Even the highly-anticipated Tchaikovsky Festival was arguably more successful from a social media and marketing perspective than musically. Trust me, I am continually amazed by the willingness of Slatkin and his staff to explore new worlds; musically, demographically, and technologically. However, very few concerts this year got me genuinely excited. With Hannu Lintu, a veteran conductor played to his strengths and conquered this historic hall. The maestro is a well-documented advocate of Jean Sibelius, and the ability to convey that passion to this particular forces is no mean feat. With no disrespect meant to Slatkin, he is not an artist renowned for cultivating a particular "sound". Lintu obviously can, and he drew craggy yet rich tones from the Detroit players that recalled great Sibelius performances. Certainly the crowd reaction was far from the polite applause that has generally followed curtain-raisers the last few years. The Cello Concerto was less exciting. While Augusta Read Thomas is an exceptional writer for orchestral forces, what she brought to her third cello concerto left something to be desired. Lynn Harrell remains a warm-hearted and engaging crowd pleaser, but given that this particular concerto gave the instrument next to nothing to do, you had to wonder why he made the trip. 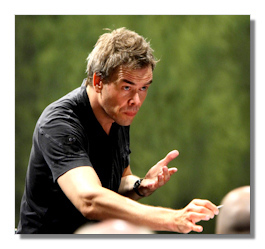 Hannu Lintu and the Detroit Symphony had a blast with the music, and made me wish that there was more to be enthusiastic about. No reservations were present concerning the Shostakovich. Okay, the brass played too loudly; I'm tired of writing it, you're tired of reading it. Principal Flute David Buck earned his yearly pay with this performance, while the always-excellent Concertmistress Yoonshin Song was technically brilliant but a touch cool. Credit Lintu; he really made these forces dig in and play. The Finale was especially satisfying. After a thunderous and measured introduction, the conductor made an unexpected and supremely effective accelerando into the movement proper. Highly virtuosic and full of great energy, this evening at Orchestra Hall proved a clear winner.